Kim Kardashian and Kanye West have found a new love nest. The newlyweds, who tied the knot in May, have been living with Kardashian's mom, Kris Jenner, since their daughter North was born in June 2013. Initially the pair were building their dream home, but according to E! News they're planning to eventually sell that property in favor of making a fresh start in a $20 million Los Angeles abode that comes with a vineyard. The new pad is said to sit on 3.5 acres, and comes fully equipped with two pools, two spas and two barbeque centers (presumably to pair with the potential vino). Kardashian relayed to People magazine that she and the husband would be moving out of her mom's place "soon," although they won't be going very far. Their newly purchased house is still near Jenner's home. "We just found a new, amazing place," Kardashian said. "It might be a few months (before we move), I'm not sure." She is a awesome women! Her surgery is outta control! 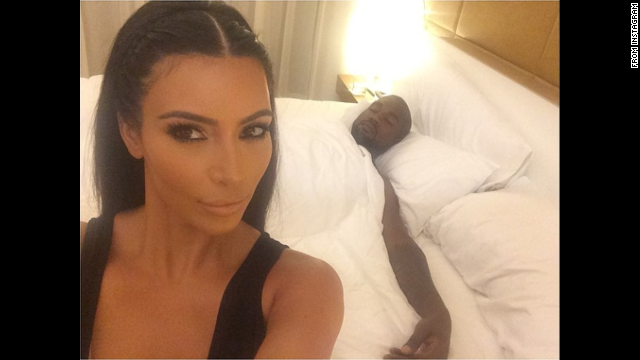 Oh no – do we really need to see Kanye sleeping. This girl is so in love with herself. I wonder how long Kanye will put up with her.